Aras leads the core UX team in Garanti Bank, a BBVA joint-venture in Turkey. 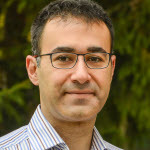 Before Garanti, he worked at world’s 3rd largest flowers/gifts site Çiçeksepeti, worked with large fintech and e-commerce clients such as Visa, eBay and Turkish Airlines at Monitise, and worked on UX planning for Tizen and Meego at Intel. Aras has a BS in Computer Engineering from Bilkent University and an MS in Computer Science from Georgia Tech. He carried out research at the Microsoft Research and Lancaster University in UK. He is an avid cook and drives his colleagues nuts by winning all food-related trivia games.